Increasing power densities, product miniaturization and stringent industry standards are all driving development in the thermal management space. Devices require more power, efficiency and performance in increasingly small footprints. Controlling temperatures in these tiny environments helps optimize performance and improve device longevity. Most electronic components have a heat threshold; consequently, an array of thermal management products exist to regulate unwanted heat. The variety, complexity, and scope of these options can be overwhelming, but they all strive for a common goal — to dissipate heat. When specified appropriately, they help components perform at optimal levels and avoid burnout from taxing heat. 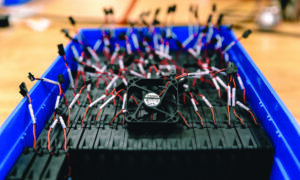 With many components increasingly vulnerable to heat, thermal management should be considered a strategic design-in purchase, but with such a wide assortment of cooling options available, selecting the right solution can seem challenging. Fans and blowers may look the same, but are differentiated by their function within an electronic system or enclosure. Fans are more often used to draw hot air out of an enclosure, while blowers are typically used to blow air onto a component or pull cooler air into an enclosure. Heatsinks are another familiar solution. 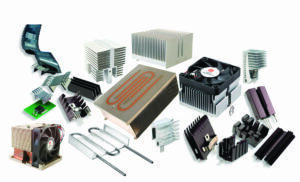 Simply stated, heatsinks absorb and disperse heat away from high temperature components. These parts are typically cast, stamped, extruded or machined, with both passive and active heatsink types available. Heat pipes and vapor chambers work differently. Here a two-phase cooling solution quickly transfers heat from one point to another. They typically work in the form of a sealed vessel, with water as the working fluid. Heat is applied in one area, the liquid turns to vapor and moves to an area of lower pressure where it cools and returns to liquid form, whereupon it moves back to the heat source. Another technology to consider here is the liquid cold plate. This heat spreader or heatsink consists of tubes filled with cooling fluids such as water or refrigerant. Cold plates are also referred to as cold sinks and microchannel heatsinks. Constructed with cross drilled holes or embedded heat pipes to transfer cooling liquid through a cold plate under the device, the heat from components is absorbed into the liquid and is then taken out of the plate and into the larger system. A thermoelectric module, or Peltier cooler, is a semiconductor-based electronic component that functions as a small heat pump. By applying a low voltage DC power source to a TE module, heat will be moved through the module from one side to the other. In addition to those technologies listed above, there are several kinds of thermal interface materials that can aid thermal management. Gap filler, grease or putty, adhesive and epoxy, as well as phase change, insulating or non-insulating, pads and films and thermal tape materials go between a heatsink and the device to be cooled. By increasing or securing contact between the two surfaces, thermal transfer is intensified. When sourcing any of these thermal solutions, there are several factors that procurement professionals should consider. Availability, product shelf life, warehousing, storage and packaging can all introduce variables, as can any modified or custom products. Although many thermal management solutions utilize standard products, modifications or custom solutions are common. Unfortunately, either one can impact availability. Ensuring a proper inventory strategy with a supply chain partner is therefore critical to reducing potential lead times. Another crucial factor is manufacturer location, since lead-times can be substantially increased when products are manufactured outside of North America. Despite the trend toward mini and compact fans and blowers, certain applications require large and extra-large frame solutions. Storage may be a concern if you require larger fans or blowers. Additionally, certain thermal interface materials may require a temperature and moisture stable environment, so understanding warehousing capabilities is essential. 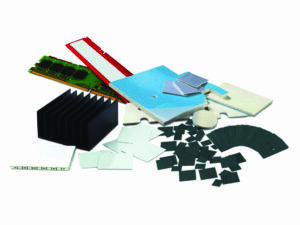 Many thermal interface materials have a shelf life of one to two years. In the case of thermal tapes, this can be impacted by the adhesives used to apply these materials. Products such as gap fillers tend to come in rolls and sheet form, while thermal pastes and putty are typically dispensed products stored in cartridges or syringes. These rolled, sheet and dispensed products can also be subject to shelf life issues. Fans, blowers and thermal extrusions range in size and weight dramatically, which means packaging can vary. Understanding how a product is packaged helps determine shipping methods. Proper packaging efforts by suppliers can ensure the integrity of the product during shipping however, packaging and minimum order quantity can also impact the purchase of products like fans and blowers. Understanding carton sizes and quantities within those packages is a critical factor in maintaining the integrity of products during shipping. Identifying the proper standard packaging quantities can help in selecting appropriate shipping methods. The weight of a product, for example, can impact the landed cost of heavier air-moving solutions. With most manufacturers of these solutions operating outside North America, utilizing airfreight can shorten lead times by four to five weeks, but can also increase the landed cost of the product. Not only is product weight a consideration when importing, but it should also be considered when determining shipping within North America. These products are best shipped ground freight when shipping larger volumes to ensure product integrity. Manufacturers or qualified supply chain partners can add value to a thermal management solution by undertaking secondary operations. Adding connectors, shortening or replacing wires on fans and blowers, die-cutting specific thermal interface materials, or cutting thermal extrusions to proper lengths, are just a few of the value-added services that can be offered by partners. With customization a common theme in thermal management, many products are single sourced, however, products like compact fans and blowers, board level heat sinks and certain thermal interface products can be multi-sourced. With lead times historically long on most thermal products, proper planning can pay off. By considering the guidelines listed above and aligning with authorized distributors that specialize in thermal management, it is possible to significantly improve time to market while avoiding these potential obstacles in the procurement process.